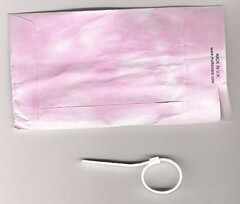 Wax paper packet sent from PLG. not too technical for you ! 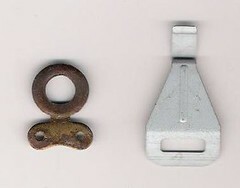 Two miscellaneous pieces from a box of treasure sent by PLG. 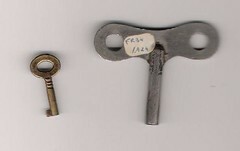 TWo keys from the box of metal bits sent by PLG. The large one has TST pierced in the top. 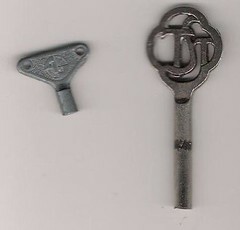 one small key found in the street in Manchester. 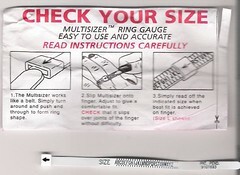 2.Slip Multisizer onto finger. Adjust to give a comfortable fit. CHECK that it slips over the joint of the finger without difficulty. Back of the ring sizer. Ring sizer in postion for use.